Brief Description: Have you ever wondered what it is like to work on a film set? Are you curious to know what goes on behind the scenes of your favourite TV series? 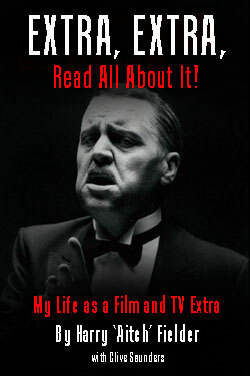 If so, you are certain to enjoy this ‘fly-on-wall’ account of life as a film and TV extra. Written by Harry ‘Aitch’ Fielder who spent over 30 years working in the film and TV industry, appearing in over 800 productions, this book will give you an insight to the life of an ‘extra’. Over the years, the author has been involved with some of the UK’s best-loved TV programmes from Z-Cars and The Saint through to Silent Witness and EastEnders as well as many blockbuster films such as Star Wars and Raiders of the Lost Ark. In this candid account Harry spills the beans about some of the well-known characters he has worked with including Alfred Hitchcock, Laurence Olivier and the great James Cagney. Extra, Extra, Read All About It is a must-have book for all film and TV fans and anyone interested in finding out what really happens on set. About the Author: Harry ‘Aitch’ Fielder was born in London in 1940. He was evacuated to the country soon after, returning to London at the end of World War II. One of six children, he left school, aged 15, after the death of his father and worked at various jobs to contribute to the family budget. Harry’s first experience of the entertainment business was playing guitar and performing in a local band. One night after a gig, his friend him tipped off about an opportunity to work on The Saint and soon after Harry made his debut as a TV extra. A chance meeting with Bill Roach (Ken Barlow in Coronation Street) subsequently led to him joining the Extras Union and more work quickly followed. For the next 32 years Harry worked as an extra, appearing in several films, television programmes and commercials. Prompted by his large fan-base to share his experiences, Harry decided to write his autobiography, and Extra, extra, read All About It was the result. Harry was happily married to his wife, Mary, for 47 years, until her death in 2010. He has three grown-up children and five grandchildren. Harry 'Aitch' Fielder is a name you will not know, but you will have seen his face on your TV or at the movies. Find out about the man who made a career out of being an Extra, as he takes us behind the scenes of many of the nations favourite classic TV shows.